Test Prep Works, LLC, has developed three test prep books specific to the Lower Level ISEE. Each of the following links will bring you to the Amazon.com page where the book is available for purchase. Additional configurations for educators familiar with these materials are described at the bottom of the page. Success on the Lower Level ISEE — A Complete Course: This book can be used to teach one-on-one or in a group setting. It includes vocabulary lessons, complete strategies for each section (including quick drills to reinforce concepts), and in-depth content instruction for the math section including practice sets that can be assigned for homework between lessons. It also includes a complete practice test. 30 Days to Acing the Lower Level ISEE: This book includes 15 workouts that are perfect for assignments between sessions. Each workout takes about half an hour and includes vocabulary and practice for each of the multiple-choice sections. 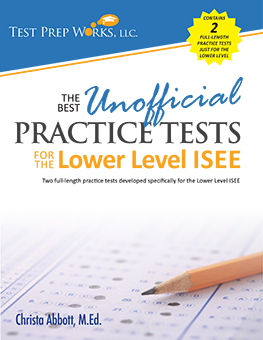 Test Prep Works, LLC, has developed two test prep books specific to the Middle Level ISEE. Each of the following links will bring you to the Amazon.com page where the book is available for purchase. The books can also be purchased at Amazon. Additional configurations for educators familiar with these materials are described at the bottom of the page. 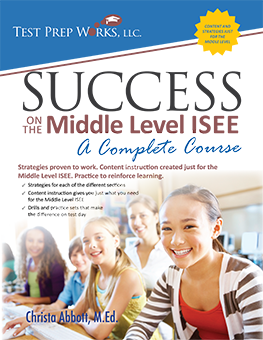 Success on the Middle Level ISEE — A Complete Course: Like the Lower Level book, this book also can be used for one-on-one teaching or with a group. 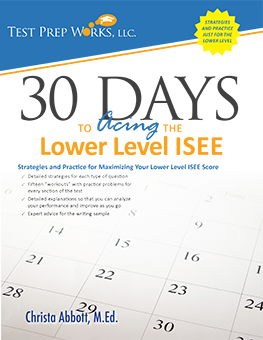 It is full of content tailored to the Middle Level test — including vocabulary lessons, strategies for each section of the test (including drills), and in-depth math content instruction. This book includes a complete practice test. Test Prep Works, LLC, has developed two books for the Upper Level ISEE. Each of the following links will bring you to the Amazon.com page where the book is available for purchase. Additional configurations for educators familiar with these materials are described at the bottom of the page. 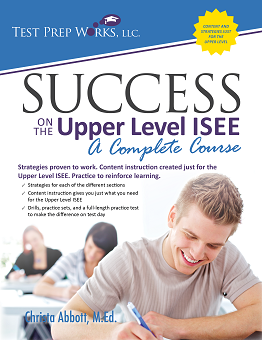 Success on the Upper Level ISEE — A Complete Course: Like the course books for the other levels, this book also can be used for one-on-one teaching or with a group. 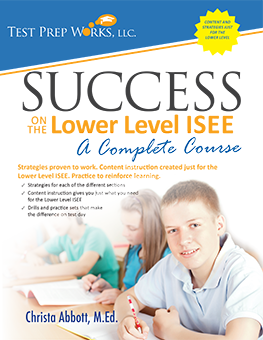 It is full of instruction and practice developed to help students prepare for the Upper Level test — including vocabulary lessons, strategies for each section of the test (including drills), and in-depth math content instruction. This book includes a complete practice test. Content from the books listed above have been combined in different ways to create the materials below. These configurations are not available through other retail channels. Email sales@testprepworks.com for more information or to order. Success on the Lower Level ISEE — Special Edition with Three Full-Length Practice Tests: Includes all of the content from the regular edition of the book plus two additional practice tests, for a total of three. The additional practice tests are the same ones found in The Best Unofficial Practice Tests for the Lower Level ISEE, so combining the two books will result in duplicated content. The Best Unofficial Practice Tests for the Lower Level ISEE — Special Edition with Three Full-Length Practice Tests: Includes the two practice tests from the regular edition of the book plus one additional practice test, for a total of three. The additional practice test is the same one found in Success on the Lower Level ISEE, so combining the two books will result in duplicated content. Success on the Middle Level ISEE — Special Edition with Three Full-Length Practice Tests: Includes all of the content from the regular edition of the book plus two additional practice tests, for a total of three. 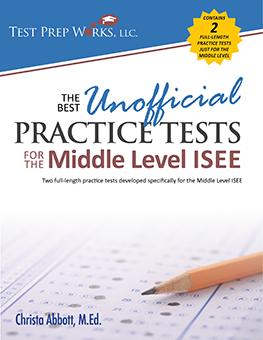 The additional practice tests are the same ones found in The Best Unofficial Practice Tests for the Middle Level ISEE, so combining the two books will result in duplicated content. Success on the Upper Level ISEE — Special Edition with Three Full-Length Practice Tests: Includes all of the content from the regular edition of the book plus two additional practice tests, for a total of three. 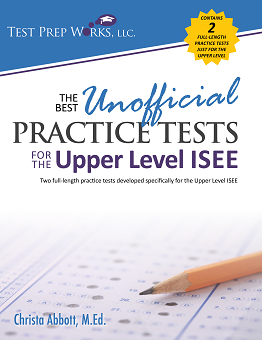 The additional practice tests are the same ones found in The Best Unofficial Practice Tests for the Upper Level ISEE, so combining the two books will result in duplicated content.